To make sauerkraut, shredded cabbage is mixed with salt and allowed to ferment. The amount of salt added is critical to assuring food safety, and should not be adjusted. Fermentation takes three to six weeks depending on the air temperature. During this time, the acidity in the product will increase. 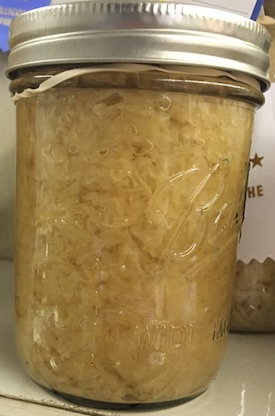 Once the sauerkraut is fermented, it may be canned or frozen. Sauerkraut can be made from all cabbage varieties; however, some varieties are better suited than others. Typically cabbage heads grown for processing are much larger than those grown for the fresh market. Sauerkraut makers are encouraged to try new varieties as well. Mature heads weighing 6 to 15 pounds with a solid, white interior are most desirable. Additionally, cabbage harvested later in the season may also contain more sugars that will support the growth of bacteria during fermentation. Head size (small to large), shape (round, flat, conical, and variations), density, and color (green, blue-green or red), as well as leaf texture (smooth or savoy) should all be considered. Wrapper leaves (number, thickness and tightness) and core length can also vary among varieties. 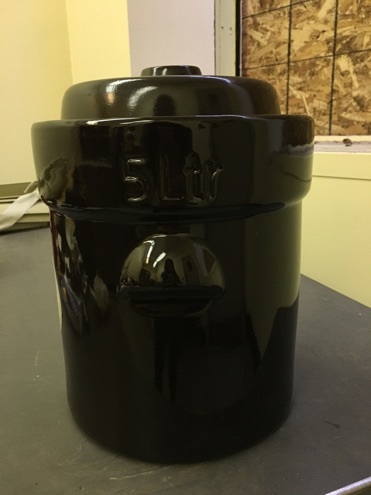 Fermentation vessels should be made out of stone, glass or food-grade plastic. Estimate that a 1 gallon container will be appropriate for up to 5 pounds of cabbage. Crocks should not be cracked or lined with metal. Containers made of aluminum, copper, brass, iron, galvanized metal, or trash cans are not appropriate. Prior to fermentation, containers should be washed with warm water and soap. Clean containers made of non-food-grade materials can be used if a food-grade plastic liner is used. Trash bags are not food-grade plastic liners. Working with 5 pounds of cabbage at a time, discard outer leaves and rinse in cold, clean water to remove soil or debris. Cut the head of cabbage into pieces and remove the center core. Shred into long thin strips, about the thickness of a quarter. Combine 5 pounds of cabbage and 3 tablespoons of canning salt and mix well. Repeat this process until you have combined 25 pounds of cabbage and ? cup of canning salt. Transfer this mixture to an appropriate container (see below). There should be 4 to 5 inches of headspace left at the top of the container. The cabbage should be completely covered with liquid, so if there is not enough juice from the shredded cabbage to cover the cabbage, make a salt brine with 1 quart of water and 1½ tablespoons of canning salt. Pickling or canning salt is preferable since it does not contain iodine and anti-caking agents. The brine should be boiled and cooled to room temperature before adding to your cabbage mixture. Suitable Containers: Stoneware crock, large glass jar or food-grade plastic container. DO NOT USE: trash cans, aluminum, copper, brass, galvanized or iron containers. Weigh down the cabbage to keep it submerged in the liquid. A heavy plate or lid that fits down into the container can be used. 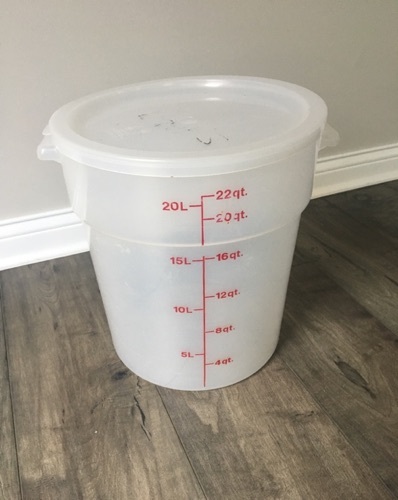 Or, use a double layer of food-grade plastic bags (like the re-sealable gallon-size freezer bags) and fill the top bag with brine for weight. The cabbage should be covered by 1 to 2 inches of brine. Keeping the cabbage protected from oxygen will help limit mold growth during fermentation. During the fermentation process, store the sauerkraut at 70-75 degrees Fahrenheit. At this temperature, your sauerkraut should be fully fermented in about 3 to 4 weeks. At 60-65 degrees Fahrenheit, the fermentation process may take 5 to 6 weeks. If the temperature is above 75 degrees Fahrenheit, the sauerkraut may become soft and lack flavor. If the temperature is below 60 Fahrenheit, the fermentation may be sluggish and the proper acidity may not be achieved. During fermentation, lactic acid bacteria (the same microbes that make yogurt) are able to grow in the high salt environment and produce acid and flavors associated with fermented vegetables. Lactic acid bacteria are found naturally on the surface of vegetables, so you do not need to add in cultures as you might with other fermented food. The salt you add and the acid produced by the bacteria will help control pathogenic bacterial contamination. Consequently, salt levels cannot be reduced in fermented vegetable preparations and salt substitutes cannot be used. The acid produced during the fermentation is what preserves the product. Lactic acid bacteria produce a variety of flavorful byproducts during fermentation. The most important of these is lactic acid, which contributes to the tartness and preservation of the finished kraut. However, other acids and flavors are also made by the bacteria as they grow. The temperature at which the sauerkraut is stored impacts the development of these flavors and the lactic acid. At lower temperatures, growth occurs more slowly. Therefore, the fermentation process often takes longer when stored under cooler conditions. When using a heavy plate, lid or jars to weigh down the cabbage, you need to check the sauerkraut two to three times a week and remove the scum if it forms. A thin film of yeast or mold (scum) may form on the surface of the fermentation brine. When using a brine-filled bag as the weight, do not disturb the container until normal fermentation is completed (when the bubbling stops). 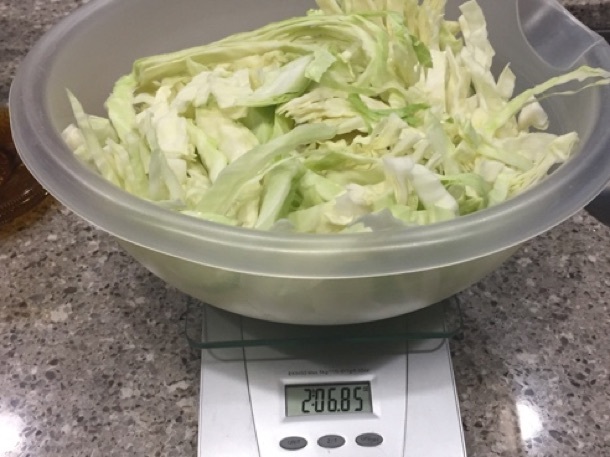 Preservation Methods: Chopped cabbage should be weighed in order to add the appropriate amount of salt for the fermentation. Once the fermentation is complete, the sauerkraut can be canned, refrigerated or frozen. Raw pack by filling jars with sauerkraut and cover with juices, leaving ½-inch headspace. Wipe jar rims; adjust lids and process in a boiling water bath. See table below for process times based on altitude recommendations. Begin timing once the water bath has returned to a full boil. Hot pack the sauerkraut by bringing it and the liquid to a boil, stirring frequently. Remove from heat, fill jars, leaving ½-inch headspace, wipe jar rims, adjust lids and process in a boiling water bath. See table below for process times based on altitude recommendations. Begin timing once the water bath has returned to a full boil. Freeze by filling pint- or quart-size freezer bags or reusable ridge plastic freezer containers and leave at least 3 inches of room for expansion during freezing. Squeeze out air, seal and label. Freeze for eight to 12 months. Andress, E., Williams, P., Harrison, J., and Reynolds, J. So Easy to Preserve. Athens: Cooperative Extension Services, University of Georgia, College of Family and Consumer Sciences, College of Agricultural and Environmental Sciences, 2014. Garden-Robinson, J. and R. Smith. Sauerkraut: From Garden to Table; FN-433; www.ag.ndsu.edu/pubs/yf/foods/fn433.pdf. Fargo, ND: North Dakota State University, 2011.